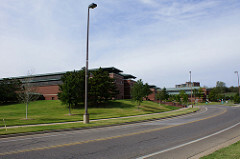 On July 20, Tulsa TechFest was held at OSU-Tulsa. There were 16 different tracks of and four different session plus a keynote plus lunch. Not bad for a free conference in town. The themes of the day seemed to be C#, Agile, Feature Flags, and AI. The keynote was given by Donovan Brown, DevOps guru at Microsoft. It was inspiring, despite the fact that he was super excited about their move to fire / transfer to other areas within Microsoft their manual QA team for their VSTS project. However he did clarify that it was a special case, that the team itself was both a subject matter expert on the product and acting as end users before doing a controlled rollout to concentric circles of customers, who are presumably more and more risk averse as you move outward. He spoke about automating all of the things, focusing on the most offensive bottlenecks first, letting developers bear the burden of whatever bad code they write, both by being responsible for automating their own tests and taking the 3am phone calls when something blows up in production. It resembled heavily the recent discussions on Modern Testing, specifically the reduction of using QA as a safety net to enable less-than-careful behavior from developers and identification/removal of bottlenecks. My top takeaways now that I've had a day to process. 1) Ed Eckenstein had the same experience I had with someone cutting them off at the McDonald's double drive through. Though, as he's done a lot of work with coaching on mindfulness, connection, and gratitude since his survival of the Oklahoma City bombing, he had a better spin on his drive-through experience. "What is the kindest interpretation of this behavior?" -- which is an interesting thought exercise. I bet his McDonald's opponent didn't get out of their car and start cursing at him with two children in earshot...so my grudge-holding doesn't seem quite so petty. Though his point was indeed well taken for all non-fast food related matters. 2) Even if developers write the highest-quality code to the best of their ability, QA provides value acting as subject matter experts. Donovan Brown said if his team were writing software for truckers, they would for sure still have some manual QA around. 3) I don't like the term "manual QA", which seems to me to be the label for anyone whose eyes see the software without the sole purpose of creating a script -- What's a better term that doesn't make us sound like early primates happily clicking their keyboards randomly...Subject Matter Engineers? Air Traffic Control? Pre-Crime Investigators? 4) Continuous improvement is a team effort. We have to support one another, both to promote a connected, low-stress working environment and to encourage experimentation. Getting better doesn't always work out on the first try.